Juone Brown currently serves in a variety of roles at Fort Valley State University to include Faculty Senate President (2017-2019), Women’s Center Executive Director and an Associate Professor. 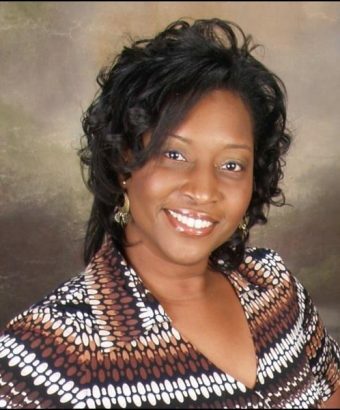 She is a doctoral candidate in the Reading, Elementary, and Special Education program at Alabama A&M University. Her research interests are in the areas of technology, communication , assessment and electronic literacy skill acquisition. Her training and work experiences are primarily in communication and the technologies for message creation and dissemination. Over the course of her career, she has trained faculty in the U.S., Ghana, Botswana, and Nigeria in the effective use of instructional technology and software to improve teaching, assessment of learning, and has assisted in the design and development of several technology centers. Additionally, Brown has been recognized for her contributions to a number of community service and outreach programs. Brown, J. (2012). Bibliographical Essay. In Newkirk, V. R., New Life for Historically Black Colleges and Universities: A 21st Century Perspective (pp. 243-252). Martin, C.E., Taylor, K., Brown-Johnson, J., (2001). Charter Teacher Education: Restructuring the University to Produce Effective Educators. Reports from the Bell South Foundation Special Initiative Recreating Colleges of Teacher Education. Women’s Conference Speaker, International Elect Ladies Conference, May, 2016. Funding Agency: The Walmart Foundation and Facility #1076 Local Facility Grant Giving Program, Project Period 2014. Position reported directly to the President of the University. Member of the President’s Cabinet. Guided deployment and operation of information technology services in all University facilities. Fort Valley State University partnered with the Middle Georgia P-16 Council, the Upward Bound Program, and the Educational Talent Search program to implement its Technology Outreach Program. Students were recruited at two levels: high school and unemployed adults age 18-25. The first phase began May 10, 1999 with the training of seven FVSU Computer Technology majors who were to instruct and tutor the 73 participants in the program. Twenty-eight students were participants of the Upward Bound program. Twenty-nine high school students were recruited from surrounding communities with a primary emphasis on students who were at risk of failing one or more subjects, dropping out of school, becoming (or presently a) parent before finishing high school. FAME– a fine arts & media program combining orchestra, band, choir, drama, dance, poetry, forensic, drawing & painting, computer design, and video/radio production in a university setting. Program designed for 7-12 grade students. Staff includes university students and fine arts professionals. Demographic reports, housing assignments, meals, transportation, and camper status. Organized assessment-focused professional development activities. Coordinated periodic evaluations of the UAS by teams of external reviewers; and other duties related to assessment as assigned by the Dean of the CoE. Guided faculty through the Instructional Design process for web-based instruction; led development teams; provided project management support; conducted assessments of course development projects; developed and led instructional technology workshops; and consulted on technology grant proposals. Students read writings from diverse traditions, including poetry, drama, autobiography, short stories, and novels, with an emphasis on literary classics. Taught lessons that helped students develop skills of close reading by showing how to “read between the lines,” both analyzing formal features of literary works and asking appropriate interpretive questions. Taught lessons that helped student gain develop and apply an understanding of basic principles of choreography, and to effectively communicate ideas, thoughts, and feelings through dance. Drama activities improved reading comprehension, and both verbal and non-verbal communication skills. Participants in the drama club experienced “gains in reading proficiency, gains in self-concept and motivation. Provided remedial instruction individually and small groups of high school students who failed one or both sections of the North Carolina Competency Test. The Walmart Foundation and Facility #1076 Local Facility Grant Giving Program, Project Period 2014. The Fort Valley State University Women’s Center will offer a free one day women’s health fair in March 2014. The women’s health fair will provide health and wellness workshops for women ages 9 to 65+. Organizational booths for participants to sign up for free health screenings and educational materials provided by community partners. Registrants will receive a gift bag filled with educational materials and health and wellness and beauty items. Attendees will be served a continental breakfast, and a sit down lunch. Sessions speakers will include community physicians, local ministers and local women’s health and wellness organizations. Topics covered will include breast cancer awareness, obesity prevention, diabetes care, pregnancy prevention and sexually transmitted disease screening and prevention services. Awarded a “President’s Research Mini-Grant” in 2007, which was to identify degree programs offered by Fort Valley State University that could realistically be delivered online and to develop a strategic plan for delivery of said programs. Currently seeking funding to implement the strategic plan. “The role of technology in the Obama presidential campaign”, 2010 Race, Gender, Class (RGC) Conference, New Orleans. February 2010. Project Plan for Online Registration and Event Management. Church of the Living God, International. (CLGI). Nov. 2005. Columbus, Ohio. July 2005. Utilizing computers in the classroom across disciplines. Abia State University Uturu. Nigeria, Africa July 2004. Utilizing Computers: Special Topics for Administrators and Administrative Support. Abia State University Uturu. Nigeria, Africa July 2004. “Video Conferencing & Web-Based Instruction.” Professional Development Workshop. University of Botswana, Botswana, Africa. January 2001. “Facilitating On-line Chat Sessions.” Professional Development Workshop. University of Botswana, Botswana, Africa. January 2001. “The Role of the Faculty Senate,” University System of Georgia Faculty Council (USGFC) Advocates Meeting. Georgia College & State University, Macon, Georgia. November 2009. Enhancing Critical Thinking. FVSU’s Quality Enhancement Plan (QEP). A Presentation by the Faculty Development Committee. Fort Valley State University, Fort Valley, Georgia. August 2009. “Identity Theft & You” – Faculty Staff Institute, Fort Valley State University, Fort Valley, Georgia. August 2004. “Protecting Social Security Numbers” – Faulty Staff Institute, Fort Valley State University, Fort Valley, Georgia. August 2004. “BANNER WEB for Faculty”– Faulty Staff Institute, Fort Valley State University, Fort Valley, Georgia. August 2003. Workshop Series – “Utilizing and Maximizing Institutional Core Applications.” Technology Development Institute. Fort Valley State University, Fort Valley, Georgia. January 2002–Present. “Using Presentation Software: Microsoft PowerPoint 2000.” Professional Development Workshop. Fort Valley State University, Fort Valley, Georgia. November 1999. “Database Management for the Classroom: Access 2000.” Professional Development Workshop. Fort Valley State University, Fort Valley, Georgia. November 1999. “Effortless Analysis with Microsoft Excel.” Professional Development Workshop. Fort Valley State University, Fort Valley, Georgia. November 1999. “Basic Computing Skills.” Faculty Development Workshop. Fort Valley State University, Fort Valley, Georgia. February 1999. “Using Word Processing and Presentation Software to Enhance Your Course.” Faculty Development Workshop. Fort Valley State University, Fort Valley, Georgia. February 1999. “Getting the Most from Your Email.” Faculty Development Workshop. Fort Valley State University, Fort Valley, Georgia. February 1999. “Creating Digital Video and Audio.” Faculty Development Workshop. Fort Valley State University, Fort Valley, Georgia. February 1999. Holmes, G., Williams-Green, J., & Brown, J. (1998). The cultural efficacy of video and static imagery during on-line chat sessions. Paper Presented at the Annual Meeting of the Association for Educational Communication and Technology, St. Louis, MO. Brown. J.L., Johnson, M. Cognitive Development, Software, and the Computer: Are We Using Learning Theories to Meet Student Needs? (1997). Paper Presented at the Conference of the Eastern Educational Research Association, Hilton Head, SC. Brown, J.L. (1997). The Effects of Culture and the Use of Interactive Technology in Computer Based Instruction. Paper Presented at the Conference of the International Visual Literacy Association, Tempe, AZ. Brown, J.L., Williams-Green, J. F. (1996). The Effects of Gender on Two Variations of On-line Chat Discussions: Video & Still Images. Paper presented at the conference of the Eastern Educational Research Association, Orlando, FL. 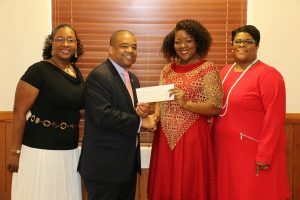 On behalf of the students, FVSU Provost T. Ramon Stuart, Ph.D., accepted a book scholarship from Delta Sigma Theta Sorority, Inc.’s Eta Chapter in May 2017. Pictured with Dr. Stuart are instructor Juone Brown (far left), Clarissa Scott (second from right) and Dr. Regina Ivory Butts. 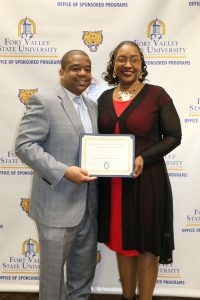 FVSU Provost T. Ramon Stuart, Ph.D. and instructor Juone Brown.